This is a guest post by Dave Hackerson. A previous post in this series is can be found here. The International Dateline is truly a fascinating thing. It’s like a magic wand of time that can both give and take, depending which way you head. Each time my family and I fly back to the Midwest, the space time continuum is seemingly suspended. Leave Tokyo at 4:00 pm, touch down in the Midwest at 2:00 pm, and then reach our final destination by 5:00 pm of the same day. Over 15 hours of travel that appears to have been compressed within the span of one single hour. I still can’t wrap my head around it at times. This dateline has a way of slightly altering our perspective of historical events. Most Americans are familiar with the following quote from President Franklin Delano Roosevelt: “December 7th, a date that will live in infamy.” The date to which he refers is the day on which the Combined Fleet of the Japanese Imperial Navy under the command of Admiral Isoroku Yamamato attacked the elements of the US Pacific fleet at Pearl Harbor. However, this is the narrative from the American side of the International Dateline. The December 24th edition of Shashin Shuhou (Photographic Weekly), a morale boosting propaganda magazine published in Japan from the 1938 until mid-1945, carried the following headline for its graphic two-page artist’s depiction of the attack: “Shattering the dawn: Attack on Pearl Harbor, December 8th”. The Japanese government christened the 8th day of each month as Taisho Hotaibi (literally means “Day to Reverently Accept the Imperial Edict”) to commemorate the great victory over the United States at Pearl Harbor and the Imperial declaration of war on the US and its allies (the day also served to regularly renew nation’s fervor and commitment to the war effort). Was Pearl Harbor a great victory for the Japanese? The answer to this question depends on the context in which the attack is viewed. From a purely military engagement view, it is safe to say that it was a resounding success, but did this single engagement succeed in shaping the course of the upcoming conflict? This is the question that the Mainichi Shinbun explored in the third installment of its series “Numbers tell a tale—Looking at the Pacific War through data” (the original, in Japanese, is here). True to the narrative on this side of the Pacific, this article was released on December 8th last year. Just as with the other installments in the series, it presents a slew of data that helps to put historical events into context. “Did the attack on Pearl Harbor truly break the US? Japan’s massive gamble with only a quarter of the US’s national strength.” The title of the article does a nice job of setting up the exhaustive economic analysis it conducts in an attempt to answer this question. The very first thing the article does is to compare the respective GDPs of the US and Japan in 1939. At this time, Japan’s GDP stood at 201.766 billion dollars. However, this amounted to less than a fourth of the US’s GDP of 930.828 billion dollars (note that figures are not adjusted for inflation). Even the UK had a larger GDP than Japan at 315.691 billion dollars. When you combine the GDPs of the US and UK, Japan already suffered a disadvantage of greater than 6 to 1. The next set of figures the article introduces is related to industrial capacity. The first thing it examines is iron production, and here the article makes reference to the quote by Prussian leader Otto Van Bismarck, who claimed that it was iron which made a nation. Taking Bismarck at his word, Japan’s iron production did not bode well for its position as a nation. In 1940, Japan’s national production of crude steel was 6,856,000 tons per year. In contrast, the US was producing nearly nine times that amount at 60,766,000 tons per year. Likewise, Japan lagged far behind the US in terms of electric power output and automobile ownership. Japan’s electric power output in 1940 stood at 3.47 billion kWh, but this figured was dwarfed by the US’s output of 17.99 billion kWh. The gap in automobile ownership is also especially telling. The 1920s are often considered to be the decade in which America “hit the roads” and became enamored with the automobile, and this fact is backed up the figures for automobiles owned by Americans in 1940. By that year, there were already 32,453,000 automobiles on roads in the US. Japan didn’t even come close, with only 152,000 automobiles scattered across the country. Nawa’s words proved to be all too prophetic. Japan’s aggressive agenda in China following the Marco Polo Bridge incident in 1937 brought heavy criticism from the global community. As the conflict in China escalated, Western nations retaliated with economic sanctions and restrictions on imports. The most devastating of these was the US’s decision to ban all oil exports to Japan in August of 1941. The US was the world’s largest producer of oil in 1940, accounting for over 60% of the world’s supply. The upper brass of the Imperial Japanese Navy had predicted that they had enough oil stockpiled to wage war for at least 2 and half years, but if the UK and US shut off all oil exports, they would have no other choice but to move into Dutch territory and seize the oil fields of within 4 to 5 months in order to augment their supply. The attack on Pearl Harbor occurred exactly four months later. Did Japan truly have the capacity as a nation to wage a modern war against a nation such as the United States? As tensions rose in US-Japan relations, Japanese government and military officials took a hard look at the data available in an attempt to answer this question. 1) The conflicting state between Japan’s military mobilization and its labor force has become fully evident. Japan has also reached its peak production capacity, and is unable to expand it any further. 2) Germany’s war capacity is now at a critical point. 3) Not a single flaw exists within the US’s war economy. Lt. Colonel Hideo Iwakuro, founder of the Nakano School and a military intelligence expert, was dispatched to the Japanese embassy in the US and took part in the planning of unofficial negotiations between the two countries. He returned to Japan in August of 1941 and met with influential figures in the political and business world, trying to persuade them of the futility in war with the US. At the Imperial General Headquarters Government Liaison Conference, Iwakuro presented the following data based on his own personal research to demonstrate the gap between the US and Japan in terms of national strength. Iwakuro’s conclusion was straight and to the point. “The US has a 10-1 advantage in terms of total war capacity. All the Yamato-damashii (Japanese fighting spirit) we throw at them will not change anything. 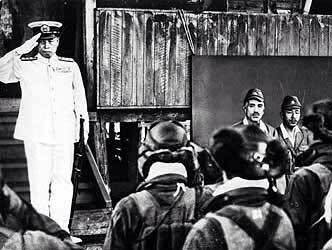 Japan has no prospects of victory.” Incidentally, the next day War Minister Hideki Tojo (who later became Prime Minister) immediately ordered the transfer of Iwakuro to a unit stationed in Cambodia. Iwakuro made the following remarks to the people who came to see him off at Tokyo Station. “If I should survive this ordeal and ever make it back to Tokyo, the Tokyo Station we see here will most assuredly lie in ruins.” Those words came to fruition in the spring of 1945. Admiral Yamamoto salutes Japanese pilots. So did the attack on Pearl Harbor truly break the US? The quote made by Admiral Yamamoto at the end of the movie Tora! Tora! Tora! puts it quite succinctly: “All we have done is to awaken a sleeping giant and fill him with a terrible resolve.” Though there is debate about whether he actually uttered those words, Yamamoto was no stranger to the US having studied at Harvard and spending time as a naval attache, and he knew full well the awesome industrial might and material resources the nation possessed. Japan played a great hand with its attack on Pearl Harbor, but as Yamamoto knew, the deck was already stacked against it. The only thing that remained to be seen was how long Japan could make its kitty last. Next Next post: What is Ethnography Good For?